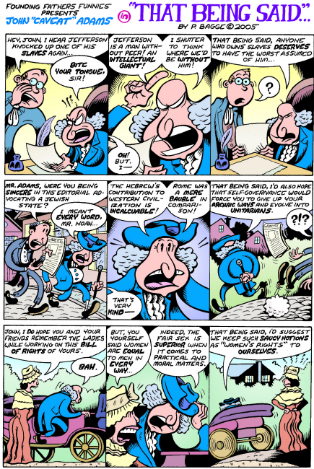 Peter Bagge and the Revolutionary War are two very random things that I’m interested in. With this entertaining, amusing and educational collection they are together at last! These comic tidbits are culled from various sources over the course of the last decade or so, and are mostly true biographical accounts of our Founding Fathers and other famous, and infamous, people involved with the war. By the end of this collection you learn that the people who came together to help America gain its independence were a group of misfits not unlike the characters in other classic Bagge stories like Hate or Apocalypse Nerd. Some of my favorite bits in this collection include the passage about a young Ben Franklin’s comedy writing that he would incorporate into the annual Poor Richard’s Almanack, much to the chagrin of his wife and his publisher, Titan Leeds, both of whom he would make fun of. He would even write obituaries for the not dead Titan while writing under the assumed name Richard Saunders. broke in and forced her and her daughter to cook for them and get them drunk on her whiskey. John Paul Jones was essentially a criminal who became a high-ranking naval officer due to insane “tactics”, like getting his ship riddled with cannon balls so they could get close enough to throw a bomb on the British ship and cripple it, despite heavy losses to his crew and him losing his ship in the process. would write notes to himself in his journal to “Be humble!” for fear that he was coming off as too cocky in his speeches and presentations. By the end of the book, one wonders how they all managed to pull it off, and in a way, in hindsight, it almost comes off as pure luck that we won our independence from England. Bagge’s art is wonderfully noodly as always, although he pulls off little details to define certain characters, like hair, a consistent accessory or a facial tick. After a while a bunch of 18th century white people in powdered whigs start to look alike, but Bagge pulls off the tricky task of distinguishing them well. There are certain Bagge cartooning trademarks that he incorporates too, especially in the facial expressions of characters committing sinister or lecherous acts. If there’s one complaint that I have, it would be the lack of narrative flow. Since these were more of a labor of love that Bagge had published at various times in various publications over the years, not knowing if he was going to make more, each biographical segment jumps around the timeline. In one comic Ben Franklin is a young and mischievous man, a few pages later he’s at the end of his life in a wheelchair. It’s not a big deal overall though, since this is supposed to be a collection of individual stories rather than a collection with a narrative arc. It’s not the story of the American Revolutionary War as a whole so much as a jumping around the timeline to put a magnifying glass on the various characters involved. It definitely helps to check the dates that Bagge posts, and maybe have wikipedia handy for looking up certain historical people after reading. One thing that history teaches us is that we generally make up our own narrative, or the history books in school do it for us. These people are presented in the most basic and whitewashed way because how can you explain to kids that some of them were drunkards that slept around, while others were privileged and petty individuals with fascinating nuance? For instance John Laurens, a man so obsessed with his legacy that he led a division into battle against the retreating British for no reason other than to get the press for it and potential placement in the history books. The move ended up getting him and many of his fellow soldiers killed in battle that day and he’s generally more of a footnote in history as a result. These were brilliant but flawed people, which are the people most fascinating to read about. In some ways it really was the stars and planets aligning that all of these people were alive at the same time and able to collaborate on reaching such a monumental and historical goal. The fact that many of them didn’t die before they were able to achieve their fame is truly amazing, given how dangerous the times were and what dangerous acts they were committing. 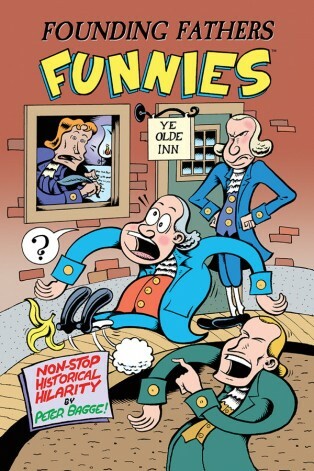 What Bagge tries to get across in Founding Father Funnies is that even misfits can achieve great things, but that doesn’t mean that we can’t laugh at their weirdness. Dark Horse Comics were very nice to provide us with a preview copy of this great collection, which comes out today in comic book shops!